The rise of Millennials in the workplace has led to endless articles about the challenges of "adulting". It turns out many adults don’t feel grown-up. So, what defines adult learners and how do they differ from younger audiences? Millennials probably take a different approach to learning than adults from previous generations. That said, all adult learners share certain common characteristics. These adult learner characteristics influence the techniques of effective adult learning. In order to successfully teach adults new skills, it’s important to identify their defining features. eLearning professionals can use these 7 adult learner characteristics to develop useful curricula, eLearning courses, and teaching techniques. Adult learners are responsible for their own lives. They recognize that failing can cost them a promotion, damage their social standing, or losing the cash invested in the eLearning course. One of the most important adult learner characteristics is that adult learners drive themselves and set their own study targets. Their eLearning courses need to be structured in a way that lets them assess their progress at individual levels. When adults volunteer for advanced learning, the decision is entirely their own. As they decide on an eLearning course to study, they need to know exactly what they will get out of it. Will they receive formal certification that will open more work opportunities for them? Will they become better at communication, learn a new language, or acquire a new skill? Adults rarely move to training for the sake of training. They need a distinct ‘why’ to convince themselves to spend time on an eLearning course. Certain forms of adult learning fall under mandatory corporate structures. Online training course requirements might be specific but, in most cases, adult learners need an extrinsic reason to pick a particular online training course. Kids largely learn by rote. They memorize the alphabet, multiplication tables, elements of the periodic table, or important historical dates. Many adults complain that nothing they learned in school was useful. Most have never used algebra, Latin, or crafts in their adult careers. So when it comes to adult learning, it’s not enough to acquire facts. They need to dig deeper and figure out how this new information fits into their existence. eLearning courses for adult learners must go beyond the ABCs of a subject matter and enmesh the online training material into daily life. The eLearning course must be relevant to them, otherwise they will drop it and find something more helpful. Adult learners have already run through the basics of reading, writing, arithmetic, and book knowledge in general. They are no longer interested in reading text and descriptions. Many adults just prefer free online training tutorials on YouTube. They want to see how someone does a particular thing, then they want to try it for themselves. This is partially a function of adventure and freedom. Adult learners need space to explore. They need the kind of eLearning courses that let them get their hands dirty. In school, classes were divided into different subjects. Math, Science, Sports, Music. In real life, disciplines overlap. In a single workday, you can use geography to direct someone to an interview. You can sing a jingle to pass time in traffic, then text a client in a foreign language. You might use complex math to calculate your tip. Adult learning needs to be laid out in inter-disciplinary modules. It needs to bring together different forms of knowledge. This encourages adult learners to absorb knowledge through the lens of their individual life experience. Adults can walk out of a virtual class or shut down their laptop at any time. They can, if they choose, drop out of an eLearning course in a few hours. What keeps them motivated to stay in an eLearning course? Results. If they can see that they are making progress or learning something useful, then they will stick with it. Be sure to put easily measured learning objectives in your eLearning course as a tool to retain your adult learners. Another adult learner characteristic is that the average adult learner has a job, commuting time, hobbies, a family, personal ambition, and external interests. They have a lot of demands on their time and endless distractions to interfere with their focus. eLearning courses are a natural choice due to their flexibility. That said, the eLearning course needs to be immersive enough to compete with all the other distractions on the online learner’s device. It needs to engage them enough to keep them from chatting, texting, or checking emails while in the eLearning course. This is key, since all these options are available and exist in the exact same physical and technological space as their eLearning course. Adult learners today possess a unique set of differentiators from earlier generations. They study when and how they want to. They need to know why they need to take a particular eLearning course. They require deeper functional knowledge that they can get their hands into. They mesh different subjects and translate them into everyday use. They need clearly defined targets, and they need to get it all done in a limited amount of time. Keep all these adult learner characteristics in mind whenever you design an eLearning course for adult learners. Are you interested in learning more about how to create eLearning courses for Adult Learners? 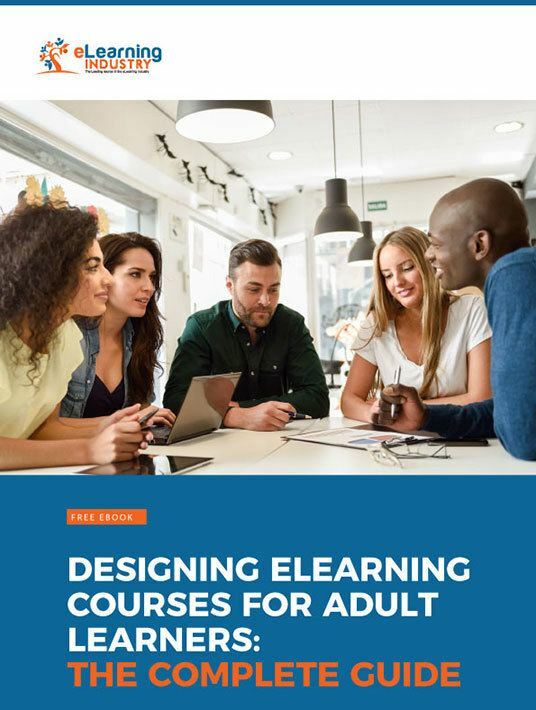 Download our free eBook Designing eLearning Courses For Adult Learners: The Complete Guide to learn about what motivates adult learners, the most appropriate Instructional Design models and Theories for them, as well as additional facts and stats you need to know about this particular audience.